The dog flea is troublesome because it can spread Dipylidium caninum. Although they feed on the blood of dogs and cats, they sometimes bite humans. They can live without food for several months, but females must have a blood meal before they can produce eggs. They can deliver about 4000 eggs on the host’s fur. The eggs go through four lifecycle stages: embryo, larva, pupa, and imago (adult). This whole life cycle from egg to adult takes from two to three weeks, although this depends on the temperature. It may take longer in cool conditions. The dog flea’s mouthparts are adapted for piercing skin and sucking blood. Dog fleas are external parasites, living by hematophagy off the blood of dogs. The dog often experiences severe itching in all areas where the fleas may reside. The dog flea can be distinguished from the very similar cat flea by its head, which is anteriorly rounded rather than elongate, and the tibiae of its hind legs, which exhibit eight setae-bearing notches rather than six. 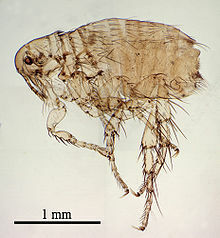 When fleas bite humans, they may develop an itching rash with small bumps that may bleed. This rash is usually located on the armpit or fold of a joint such as the elbow, knee, or ankle. When the area is pressed, it turns white. When dogs are troubled by fleas, they scratch and bite themselves, especially in areas such as the head, neck, and around the tail. Fleas normally concentrate in such areas. This incessant scratching and biting may cause the dog’s skin to become red and inflamed.